Great staff, the restaurant was really good and they have a flavor water machine, which I loved. Bus to Disney Parks liked. And bicycles to use. Pool and hot tub. We were greeted with a surprise $25 per night fee for misc things we don’t use and a filthy room. Staff was polite and overall pleasant. This was a wonderful property, clean and spacious and at a GREAT Price. My bed in the front-pullout couch bed had to be changed as soon as I got there. Bed Bugs and insect droppings. Shower pressure was sporadic. However, overall, room looks up-to-date with a kitchen. Flights were all cancelled but the staff were wonderful. Held our room after we had checked out, gave us a late check-out. The bell hop even taught my daughter how to play hopscotch. Just a great experience (amidst a pretty awful return home). Nice hotel close to Disney Parks.The advertised rate per day is a little misleading. We needed an overnight for an early morning procedure at the hospital next door. Perfect place. Spacious, clean, quiet, and food is good. 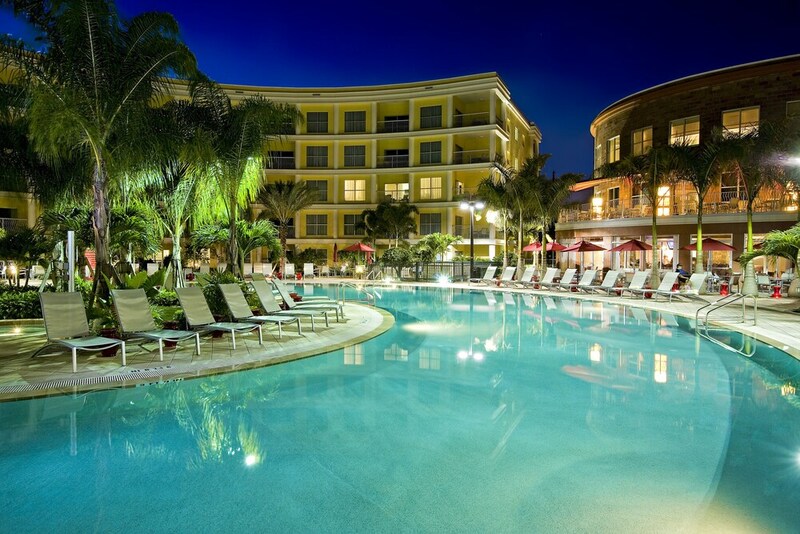 This hotel is perfect for those who want a great place to relax after Disney! I would definitely stay here again. The suite was clean. Some natural wear on the furniture, but overall, clean and spacious enough for our family (2 adults and toddler in a one bedroom suite). It was in a great location - close to Disney and lots of dining options and grocery store nearby. We only dined in the restaurant once, but the food was good and reasonably priced. The pool temperature was a little on the cool side, but it was clean and enjoyable for the little one. Melia Orlando Suite Hotel at Celebration places you within 2 miles (3 km) of popular sights like Celebration Golf Club and Old Town. This 289-room, 4-star hotel has a restaurant along with conveniences like an outdoor pool and free in-room WiFi. Enjoy a bite to eat at the hotel's restaurant, or relax with a drink at the bar/lounge. Satisfy your hunger from the comfort of your room with room service. For your convenience, a buffet breakfast is served for a fee each morning from 7 AM to 10:30 AM. A plasma TV comes with cable channels, and guests can stay connected with free WiFi. Beds sport Egyptian cotton sheets and the bathroom offers a hair dryer and designer toiletries. Other standard amenities include an iPod dock, a coffee maker, and free newspapers. At Melia Orlando Suite Hotel at Celebration, guests enjoy features like an outdoor pool, a fitness center, and a spa tub. You can take advantage of free parking, along with limo/town car service. Multilingual staff at the 24-hour front desk can assist with dry cleaning/laundry, concierge services, and securing valuables. Other amenities at this golf hotel include free WiFi in public areas, a meeting room, and free use of bicycles. Thank you for being our guest, we look forward to welcoming you back on your next trip to the Celebration/Disney area. Thank you for your kind words, exceeding your expectations in hospitality is our desire. We look forward to having you as our guest very soon. I appreciate you taking the time to share your thoughts on your stay with us. I am thrilled that our team made your experience with us so memorable- I will personally pass along your commends to our team. Thank you, and I hope to welcome you back soon. Thank you for being our guest and for writing such a complimentary review. We are delighted that our inspired service and accommodations exceeded your expectations. We hope that your exceptional experience will bring you back to enjoy even more in the near future. Thank you again for choosing The Melia Orlando Suite Hotel at Celebration. 360 American Bistro & Bar - Restaurant and bar specializing in American cuisine. Open daily for breakfast, lunch, and dinner.